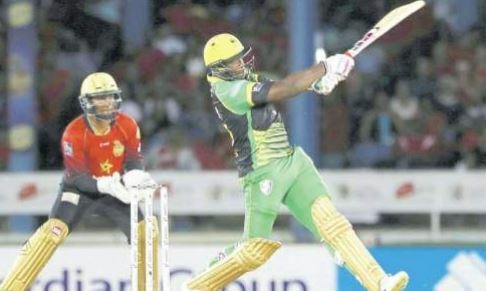 PORT OF SPAIN, Trinidad (CMC) — Twenty20 star Andre Russell plundered an astonishing, unbeaten hundred and also grabbed a hat-trick, as he dragged Jamaica Tallawahs to a dramatic come-from-behind four-wicket victory over reigning champions Trinbago Knight Riders (TKR) in a thriller here Friday night. Chasing a record 224 for victory in the third match of the Caribbean Premier League at Queen’s Park Oval, Tallawahs found themselves in strife at 41 for five in the seventh over and staring at a heavy defeat. Arriving at the crease with Tallawahs facing an improbable required run rate of well over 13.5 runs per over, Captain Russell unfurled a magnificent 121 off just 49 balls to propel his side over the line with three balls remaining. The right-hander crunched 13 sixes and six fours in a phenomenal display of power-hitting, posting 161 for the sixth wicket with fellow Jamaican Kennar Lewis (52) — the joint highest-ever partnership in the CPL. Dropped off the first ball he faced when Ali Khan misjudged a top-edged slog sweep at backward square leg in the seventh over, Russell stormed to his half-century off 22 balls and required only another 18 deliveries to reach three figures — his second in T20s — and also surpass 4,000 runs in his 257th match. “[It’s my] first game as a captain at this level, definitely it’s a good start. I am going to enjoy this till it lasts. The hard work has been paying off,” Russell said afterwards. Russell had earlier starred in the TKR innings, snatching a hat-trick in the final over to finish with three for 38, as the home side reached 223 for six off their allotted 20 overs. Sent in, TKR appeared to have put the contest out of sight when Colin Munro top-scored with 61 and fellow New Zealander Brendon McCullum struck 56, en route to the highest total in CPL history. Chris Lynn chipped in with 46 while left-hander Darren Bravo got 29 as TKR frenetically gathered 77 runs from the last five overs of the innings. Sunil Narine (7) picked out long on with left-arm spinner Imad Wasim in the second over with 10 on the board but Munro and McCullum then anchored the innings beautifully. First, Munro hammered five fours and three sixes off 42 balls, putting on 98 for the second wicket with Lynn, who belted four fours and three sixes in a 27-ball knock. When both fell in the space of 19 balls for the addition of 22 runs, McCullum took charge of the back end of the innings, adding 86 for the fourth wicket with Darren Bravo who slammed a couple of fours and sixes in a 16-ball cameo. All told, McCullum faced just 27 balls and counted five fours and four sixes. West Indies seamer Kemar Roach leaked 30 runs from the penultimate over but Russell removed McCullum, Bravo and Denesh Ramdin (0) in the final over which cost only 11, to slow TKR’s momentum somewhat. The Tallawahs’ run chase started disastrously when Glenn Phillips (6) miscued the third ball of the innings to short third man off pacer Ali Khan (3-24) and Andre McCarthy tugged the fifth delivery to mid-on, to depart without scoring. Ross Taylor (1) and Rovman Powell (1) fell in successive overs to leave Tallawahs on 16 for four in the fourth over and opener Johnson Charles thrashed five fours in a 16-ball 24 before playing back to a Fawad Ahmed (2-46) googly and falling lbw. Russell then sensationally transformed the contest. He blasted Fawad for a pair of sixes in the 11th over which cost 15 runs and also ripped into off-spinner Narine in the next over with another brace of sixes – the second of which raised his half-century. Captain Dwayne Bravo came under assault from Russell in the 13th over, giving up 22 runs, and seamer Javon Searles saw 18 runs come from his opening over — the 16th of the innings — as Russell and Lewis combined to take him apart. The game was still in the balance with 53 runs required from the last 24 balls but Russell took 20 from the 17th over bowled by Dwayne Bravo and 17 came from the next from Fawad, even though Lewis perished after striking four fours and two sixes off 35 balls. By then, Tallawahs needed just 16 from the last two overs, and Russell put the game to bed in the final over when he cleared the ropes at long-on with Narine.